So, you've probably seen the "Free Gold" button in the In-App-Purchases section of the game. I have used it in previous updates, and decided to test it out again this morning. In this topic I will answer some frequent questions about it, and how to use it safely. It does, but it really depends on what offers you try. The video ads only give one coin each, but they are the most reliable. The download-and-run offers usually work as well. Yes and no. Absolutely do not use your real email address or location to complete the offers, unless you are doing one for a service you recognize that you maybe were planning on getting anyway (Example: Hulu or Amazon Prime). Always make sure the website's address matches the address of the official site of those services, they otherwise may be a phishing attempt. 3. Why use a separate email address to complete forms? 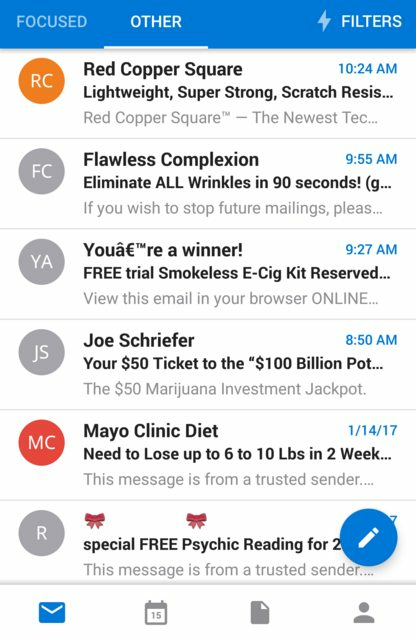 That's what my inbox looks like now. By making a separate Gmail account, you should be able to complete the offers and avoid getting spam in your regular email. This will also protect your actual email account and other accounts from being hacked. I've had to change my Facebook password many times. 4. Why isn't my gold showing up? Be patient. Close the app and open it in a few hours. If the gold doesn't show up within a day or two, tap "Missing Coins?" in the bottom right corner and fill in the form. Now, the second one looks tempting, doesn't it? Except it's really not. The window for completing the offer is 7 days, however, it takes over three and a half days just to wait for the upgrades to finish, not to mention you have to upgrade the prerequisite buildings and wait for them to finish, too. It might be possible, but not without a lot of time investment. Unless you have a whole week to play that game, the first option might be better. Other app offers may just say to "install and run" or "complete the tutorial" for the same app. Choose the tutorial one, because it nets more coins, and will disappear if you choose the first one. The third option may say it's free, but completing it requires a valid credit card and you might end up forgetting about it. It basically sets you up with a $9 monthly subscription unless you cancel it before the trial is up. On most offers like that, you need to keep the subscription for at least two days to complete it. If you do try one like it, set an alarm two days ahead and remind yourself to cancel the subscription. The last option needs an email address to complete. It's basically a spam sign-up form. These usually do not work. They tend to redirect you to a completely different site, or attempt to give your device a virus. If you do try one, make sure any links you open default to an adblock browser, and never use an email you have tied to other accounts. For an address, I just use the location of a random McDonald's in Alabama. They sometimes work, and they sometimes don't. Do not click on offers with a $ sign next to them. They will cost you money, could possibly be fake, and even cost more money than they give you in coins. 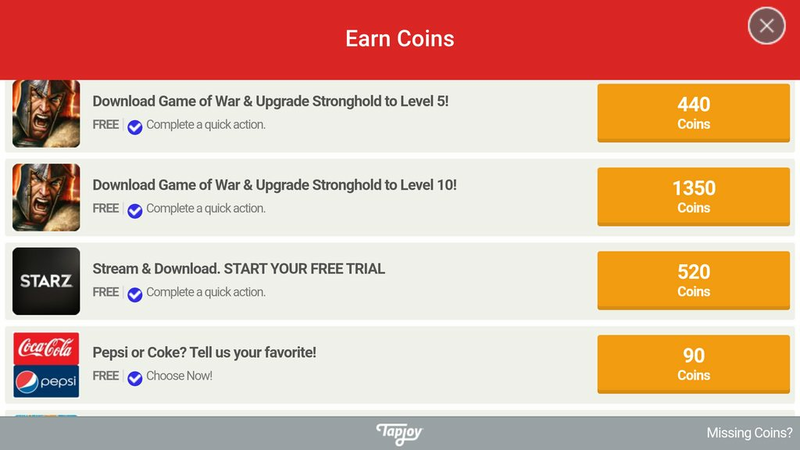 TapJoy is pretty annoying, but it's a quick way to get a few more coins for garage expansion. I messed around with it for about two hours, and ended up getting 492 gold out of it. So, if you're bored, low on gold, or want that upgrade quicker, it's a better option than waiting 5 days for that 50 gold they give you. Just remember, if they are giving you something for free, you're the product. Again I've already figured this stuff out easly and a lot of newcomers have already used this or can figure it out easly. If they have questions about it they can ask in chat. TapJoy won't work on my iPad. cant they just take away the garage expansion fee? Stop being so negative. Qnomei has put a lot of time and efforts to create this very tutorial with all its important informations and facts. Many users find this kind of tutorials very helpful, hence why he created it in the first place. Thank you, Qnomei, very good job. Edited by basmal121, 19 January 2017 - 01:37 PM.